Athletic footwear has become ubiquitous since the mid-1950s, and it is easy to forget that sport shoes were initially designed for a specific purpose-for functionality, comfort, and to maximize athletic performance. As diverse as traditional footwear itself, athletic shoes fall into the following categories: running/training/walking, court sports, field sports, winter sports, outdoor sports, track and field, and specialty shoes (i.e. gymnastics, weightlifting, water, etc.). Shoe development dates back 10,000 years, stemming from the need for protection from rough terrain. Egyptians used sandals for ball games as far back as 2050 B.C.E. Ancient Roman spiked military shoes called "caliga" were used as weapons against opponents. Greek athletes in the ancient Olympics preferred running barefoot before adopting sandals in the eighth century B.C.E. Until 1860, more attention was given to style and fashion rather than to functionality-particularly for women. Sport shoes, if worn at all, did not differentiate much from each other and imitated the handmade styles and leather construction of traditional footwear. Skating boots, for example, were merely adaptations of high-cut Victorian style street boots with blades. Leather bars were sometimes placed across the soles of soccer shoes for traction. Football and baseball players wore identical high-cut leather shoes before cleats were introduced in 1890 and fashion determined the height of the boot. The popularity of recreational sports, previously restricted to the wealthy upper class, developed in the late nineteenth century as a response to increased amounts of leisure time by the general public. Public interest in sports coincided with the marathon era and the beginning of the modern Olympics. Of significant importance was the advent of the canvas sport shoe-adopting the term "sneaker" in 1873-that followed Charles Goodyear's 1839 development of vulcanized rubber. From croquet to running, boating, tennis, and bicycling, this multipurpose shoe influenced street fashion with its variations of sateen, canvas, or buckskin uppers and black or brown leather bands. It was not until the beginning of the twentieth century that mass production of shoes made athletic footwear readily available to the general public. The first great athletic shoemakers, including Joseph W. Foster for Reebok, the Dassler brothers, Marquis Converse, and Leon Leonwood Bean (L.L. Bean) arose at this time. Increased competition in sports accelerated the quest for developing more comfortable, better-performing, flat-soled shoes. As amateur athletes became professional, they influenced the maturity of sports and athletic shoes became more specialized. By the 1930s, athletic shoe companies J. E. Sullivan and G. L. Pearce of the Spalding Company, the Dassler brothers (who later split into Adidas, Inc. and Puma, Inc.), Richings of the Riley Company (later renamed New Balance), Chuck Taylor of Converse, and J. Law of England became internationally recognized. Vulcanized rubber sole tennis and basketball shoes, traditionally in black and white shades, were now offered in a variety of colors. Skating boots with Nordic pin binding, previously in black and brown, became available for ladies in white. Interchangeable cleats and nailed-on studs were used for field and winter sports, and track shoes became lighter and more functional. Out of sheer necessity, protection and function were major factors in the design of many sport shoes. In 1935, inspired by near-fatal accidents involving footwear, Vitale Bramani invented a multipurpose-soled mountain boot and Paul Sperry created a non-slip sole for boating. L.L. 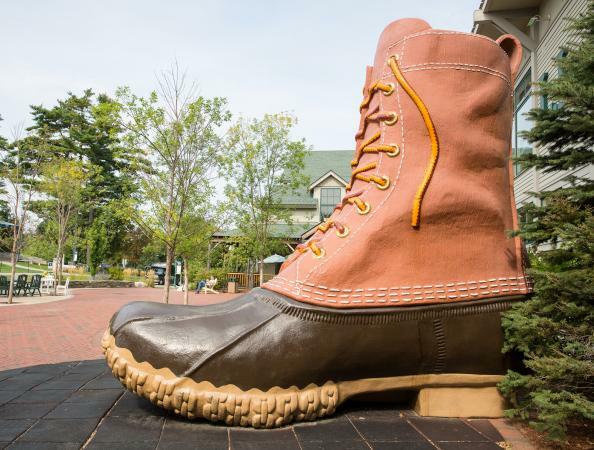 Bean launched his company in 1911 with leather and rubber galoshes that served as a solution to chronically wet feet during his hunting expeditions. 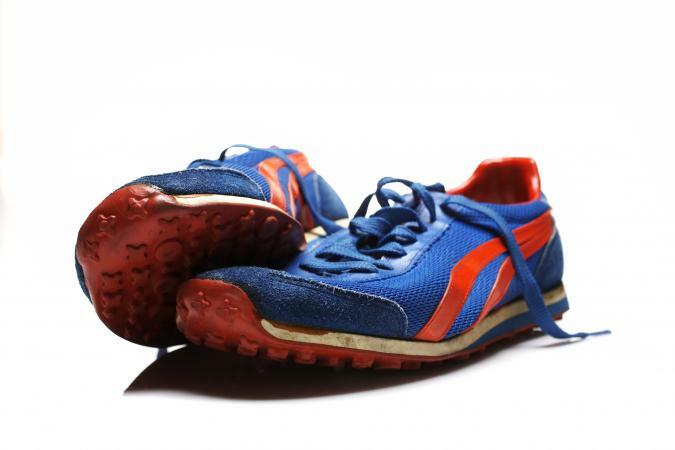 As competition increased on the Olympic track fields and collegiate basketball courts following World War II, better-performing, lighter-weight athletic shoes were highly sought after. Keds and the Converse "sneaker" basketball shoe led the American athletic market while simultaneously becoming an American postwar youth symbol when worn with blue jeans on the streets. Onitsuka Tiger, formed in 1949 and forerunner to the brand Asics, introduced new materials such as nylon uppers and blown rubber wedges and midsoles on their shoes for long-distance runners. New Balance also catered to this group by introducing width fittings and engineering shoes with rippled soles for traction and heel wedges for shock absorption. Bob Lange's mono-bloc polyurethane injected downhill ski boot invented in 1957 was voted the most innovative shoe construction of the century a decade later. European manufacturers Adidas and Puma dominated the athletic footwear market in the international sports of soccer, tennis, and track, as they aligned themselves with winning collegiate and professional teams to promote the performance image of their shoes. Adidas's leather basketball stitched-shell shoe construction, for example, was launched, outfitting half the UCLA and Houston players in their national championship competition. Along with Tiger in Japan, they gave birth to centralized sport-shoe marketing and early biomechanical shoe designing. By the end of the 1970s, the U.S. sports scene evolved into a more general pursuit of individual fitness. American sport shoe pioneers Bill Bowerman, Jeff Johnson, and Phil Knight (founders of Nike, Inc.) introduced major innovations ranging from nylon uppers and full-length cushioned midsoles to running shoes, the waffle sole, air cushioning, and a variable width lacing system. Meanwhile, traditional U.S. sport shoe companies also began to compete internationally with Europeans and Japanese with "pseudo-athletic" styles to cater to this new market. Reebok, catering to the trend toward fitness activities at the time, created a soft napa leather athletic shoe aimed specifically at the female consumer in 1982. Spearheaded by the running boom in the United States, sport shoe design went beyond material composition to encompass biomechanical ergonomic footwear design. Biomechanical, electronic, and computer testing were added to the old practice of wear testing. Ratings of running shoes in the magazine Runner's World (established in 1975) also intensified product development improvements. Advanced technological and biomechanical research has made athletic shoes more specialized, more functional, more technical, and more expensive. Sport shoe companies, once a humble and modest specialized segment seeking practical solutions to footwear problems, developed into trendsetting multibillion-dollar lifestyle brands since the 1950s. Professionalism through televised sporting events and sports star endorsements has dramatically increased the public's interest in sports. Advanced science, athletic professionalism, and an increasing population seeking more comfortable lifestyles in the second half of the twentieth century, has provided an environment that allows sport shoes to become even more pervasive in the future of fashion and apparel. Cavanagh, Peter R. The Running Shoe Book. Mountain View, Calif.: Anderson World, 1980. Cheskin, Melvyn P. The Complete Handbook of Athletic Footwear. New York: Fairchild Publications, 1987. Provides an in-depth analysis of sport shoes, including their history, their technical construction, and contemporary approaches in marketing and advertising. Farrelly, Liz, ed. The Sneaker Book. London: Booth-Clibborn Editions, 1998. A global collection of opinions covering trendsetting sneakers as social phenomenon. Heard, Neal. Sneakers. London: Carlton Books Limited, 2003. American collector's manual of classic athletic footwear in the twentieth century. Rexford, Nancy E. Women's Shoes in America, 1795-1930. Kent, Ohio, and London: The Kent State University Press, 2000. Includes a chapter on women's sport shoes and the relationship between shoe styles and gender roles in American culture.